Redline Ballistics has partnered with LAX Ammo to bring our high-quality, affordable ammunition to gun shows throughout California. With the current online ammunition sales laws changing in California, we are making an effort to make our ammunition more accessible to California residents, by opening new stores and attending as many gun shows as we can. We make sure to bring a variety of calibers and types to every CA gun show. If you have any questions, feel free to contact us at any time at info.rlbinc@gmail.com. 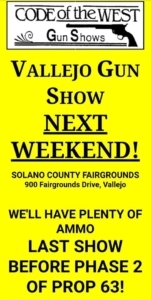 April 6-7 Redding Sportsman's Expo, Redding Civic Auditorium, 700 Auditorium Dr., Redding, CA $5 admission with free parking, Veterans FREE on Sunday.